Playing a range of contemporary Bluegrass and original songwriting songs Frank draws on his Celtic Heritage fused with American musical traditions to create his own unique sound. 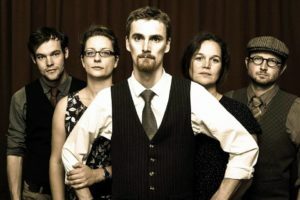 The Frank Burkitt Band consists of a 5 piece string band with Singer Songwriter Frank Burkitt on lead Vocals and Guitar, Kara Filbey on backing Vocals, James Geluk on Bass, Cameron Dusty Burnell on Mandolin and Krissy Jackson on Fiddle. WAI.TAI is a collective of musicians under the direction of Robyn Kamira who writes and arranges songs and tunes in both Te Reo Maori and English, and fuses them with World music. Musicians for each concert are selected from around the country to ensure that the best mix of instruments and styles come together for the occasion. They’re the same sets with musicians bringing their own beautifully different flavours! Oparau’s lineup is Robyn Kamira (guitar and banjo-uke), Krissy Jackson (fiddle) and Janet Muggeridge (mandolin). Photos by Carol Knutson and Simon Travaglia (see more of Simon’s photos on Facebook).